At Piroshky & Crepes in southeast Everett (1327 112th St. SE; 425.225.6694), the pastry case is filled with both treats and history. New owner Marina Dutra, who took over the bakery and café in July, plans to preserve the legacy of Aleksey Avramenko and his parents, Liliya and Roman, who opened the restaurant in 2011. The menu was developed from recipes found in the Avramenkos’ old family cookbooks and is filled with dishes that those with a Slavic heritage will recognize. Among the offerings: piroshky (Russian stuffed buns) and favorite foods from other European countries, from France to Ukraine and beyond. 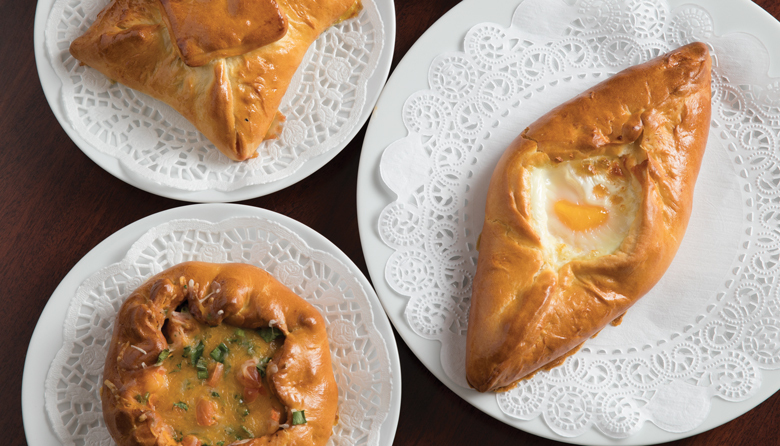 Adzharian khachapuri are like little dough boats with soft eggs floating on deck; Russian shortbread cookies, korzhik, come sprinkled with sliced almonds or doused in cinnamon and sugar; and a cottage cheese crêpe is so authentic, former owner Avramenko says it once brought an older customer to tears because it tasted so much like the crêpe her mother used to make. While the café’s ownership has changed, the borsch recipe is unlikely to. This beet and vegetable soup leans toward the Ukrainian style, with a base of sautéed onions and carrots, and is popular with customers. And for many of those customers, the soup, like much of what’s served at the café, is a comforting reminder of home. This vegetarian (vegan without the sour cream garnish) soup is fairly simple, but does require a little prep time to get the beans and potatoes cooked. Don’t hesitate to let a food processor take over the heavy lifting on the shredding. In a large pot, boil 6 cups of water and add the unshredded 1/4 cabbage, red pepper and celery. Simmer for 30 minutes, then strain the vegetables from the liquid--which is now a broth. While that cooks, in a large pan heat the oil over medium-high. Sauté onions with 1/2 tablespoon of salt until starting to brown, about five minutes, then add carrots and cook for another two minutes. Add beets and let cook for three more minutes. Finally, mix in the tomato paste and cook a few more minutes. Into the simmering broth, add the potatoes, shredded cabbage, beet mixture and remaining salt. Taste the broth and add additional salt if needed. After about five minutes, add the beans and bay leaf, then let simmer for 5 more minutes. As it finishes, add the lemon juice, green onion and parsley. Divide into bowls, and serve with a dollop of sour cream in each bowl. Note: The sour cream adds a little creaminess to the soup, but also helps if you want to eat the soup straight from the stove: stirring it in cools the down the soup. At Piroshky and Crepes, as in some parts of Russia, the borsch comes with a little hot garlic bun. For a quick imitation, dollop a little garlic butter on a dinner roll. While you'll often see borsch spelled with a "t" at the end, the Russian pronunciation doesn't have that sound, and thus neither does the anglicized spelling, either at the cafe or in this article.